Look, we have to find lots of ways to help our organizations -- sometimes one person or one team at a time -- move toward the future. Innovation lies not only in cutting edge workplaces, but finding openings within the majority of them, which are not. One of these openings is with the hidden leaders of organizations that know in their bones that things could be better in many ways, including trust. They know when their group trust levels could be more than they are. Instead of waiting for the leader, other members, or someone from HR to initiate and facilitate change, members can begin the change process themselves. They do this by opening up the conversation about what their relationships with one another could be and should be. The Team Trust Survey is a free instrument teams and leaders can use to begin a transformation of trust levels with one another. This could be a starting point toward "cracking the code" of past hierarchical mindsets. Or for some groups, a tipping point toward a significantly new way of working together. This is not a lavish hack, it's a quiet one. It's not super intellectual, based on brain chemistry or a morality play. It's based on my personal experiences as a consultant and professional dreamer about the possibilities for people, teams, and organizations. You can immediately download a copy of the survey by clicking this link. 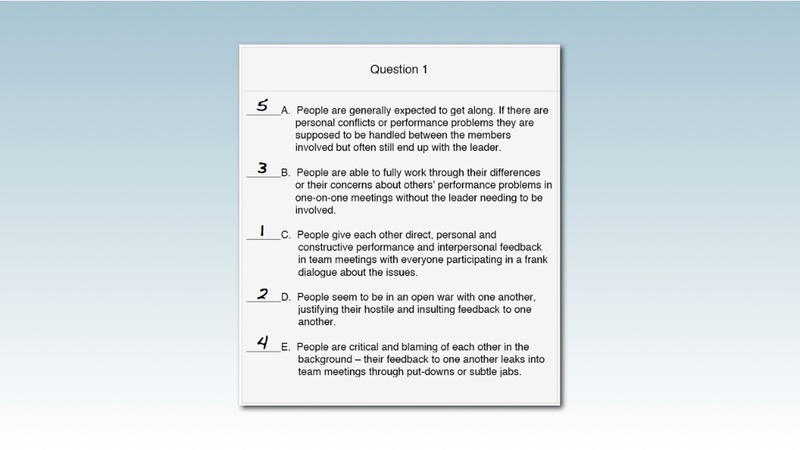 • how to introduce the survey and trust-building work to a team. These tutorials are also available on this hack, embedded in the Materials section, below. The team trust survey website is new as of September, 2010 and is likely to be tweaked as I learn more about what works best for people using the survey and website. At the moment I am also developing a free workbook as an additional download from the site. The workbook will augment the survey by helping walk a team members through discussions of their' ratings, co-create their plan to increase trust levels, and engage in follow-up exercises. As a consequence of taking too narrow an approach, some or all of these aspects of experience may remain unaddressed or completely undiscussable -- meaning they are only talked about in the background, not directly with those who can do something to change the situation. How team members view these areas can stimulate a much deeper conversation and can offer a rich opportunity to jointly define a developmental pathway and meaningful personal and interpersonal change -- if the process is based on group choice and self-determination. II. The energy for team development lies underneath a "default" culture of fear and cynicism. The conditioning of the past is still with us. People continue to be concerned about any environment in which too much disclosure could work against them. An older workplace culture, based on environments in which messengers "get shot" and where no one wants to be labelled as "not a team player," may be less prevalent than it once were. But if that culture is more buried than it used to be, it still isn't very far underground. The fears of repercussions and cynicism associated with this default culture still erupt easily enough under conditions of stress and change, causing mistrust of any effort that could make people suddenly more open and therefore vulnerable. The bottom line is that this keeps team trust and performance at middling levels. Conscious team development is shunned except for fix-it strategies when mistrust becomes too obvious, but this misses the potentials for growth, creativity, and innovation that higher trust levels can bring. We need to find better ways to release the energy for change that is already there, and to do this in ways that do not always have to come from the top or outside the group, but can come from anyone at any level who is willing to start the conversation about team trust. The Team Trust Survey is a free discussion tool that any member or the leader of a team can introduce to a group as a way to liberate the energy for change. Team members download the survey, rate it, and then gather to share their results with one another. The goal is initially two-fold: to develop general agreement on one of five overall trust level ratings, and to develop a shared path forward. The process of developing these agreements naturally takes the group into a discussion of the behaviors that will most foster trust -- or undermine it -- in the group. It is also likely to bring up the issues unique to the team that may be keeping trust levels plateaued. As the behaviors and the issues are revealed and addressed by members, the group becomes more conscious of the its possibilities. • introduce and engage the team in trust development efforts. But the survey is also only a framework, a container within which the group must itself decide whether, in fact, these are the most important development tasks, and how to accomplish them, drawing on the wisdom of the team itself. This is no cookie cutter approach. two members need to work out their conflict on behalf of the team's overall performance. everyone needs to work on at least one ground rule for improved communications based on their self-observations and feedback from others. These are only examples. The discussion results in a plan that responds to the felt needs and perceptions of group members and will be unique. Whatever this plan, however, the deeper outcomes are learning, consciousness, interpersonal respect and openness. 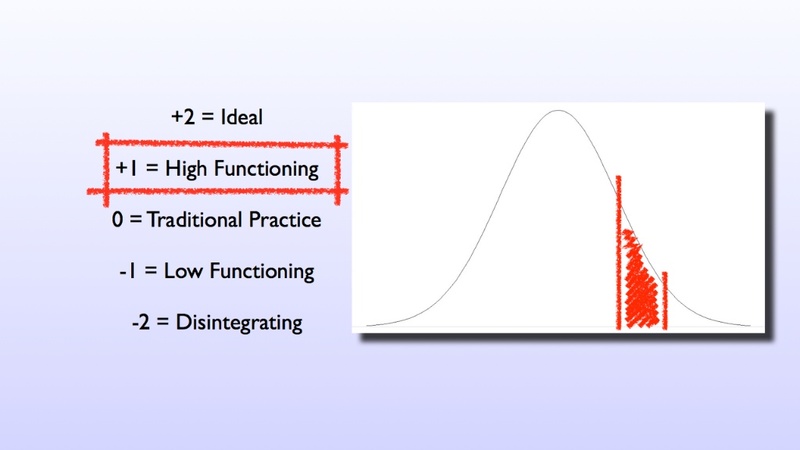 These are subjective qualities, and they are foundations for improved performance outcomes. Amy Edmondson, Novartis Professor of Leadership and Management at Harvard Business School, has shown that where people feel free to be themselves, where mistakes and problems are discussable, the result is much faster team learning, which in turn means adaptation and innovation thrive. When teams become safe enough for members to talk directly to each other across the team table about each other (rather than behind their backs) whatever issues the team faces can addressed and resolved more rapidly. But more than this, when teams become safer in this way, they are truly free to create a vision of what the team could be -- and what the organization and its relationships could be, as well. As co-author of Driving Fear Out of the Workplace and The Courageous Messenger, it became clear to me that teams could be deeply challenged by their "undiscussables," but even when team members mastered some of the skills needed for higher trust, the old-style hierarchical models in their guts still held people back. The siloed view of people, including the focus on individual styles in otherwise well-intended, programmatic, super-expensive team development efforts, does little to support the combined talents and synergies that define a team from the inside out. This definition best comes from team members' sense of mutual ownership for the team's growth and change. it can be a bridge to a self-determined future from a hierarchically determined past. This defines the most important "practical impact" of the survey. 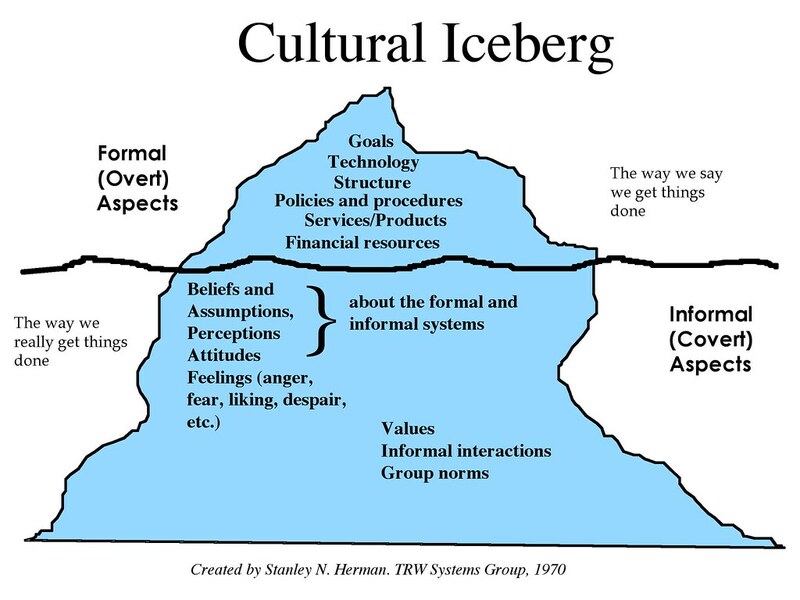 To use Stanley Herman's view of the organizational iceberg (click the link or see the image below), it comes literally from "below the water-line." It belongs to anyone and everyone as a way to help teams move the current culture forward. Building the Team Trust Survey and associated website has been supported by many friends and colleagues. Among these I would point to consultant Mary Allison for her feedback on the scales, and internet social scientist, Joe McCarthy, for both his sage advice about making the survey free and helping with the website design. Additionally, I would like to thank Theresa Lawrence, Strategic Marketing Director at Ultimate Software (rated as one of the best places to work). Theresa kindly offered to include the survey with Ultimate Software's own broad marketing efforts. As a result, the survey has been downloaded about 3,000 times from my own sites and through Ultimate Software. Without this support, I might never have figured out it would be a good idea to develop a dedicated website -- just now created -- for the survey! And thanks to all of you who post your comments here, too, as a way to help this idea grow and prosper. This Hack rocks. I think it is great. I know what you mean about sort of thinking about it as a "quiet" hack, but I've found that the impact of such interventions are far from quiet. One part of this Hack that really stood out for me is that there are tutorials for how to build trust at different stages. This is so key in my mind. So many efforts are built on one kind of idea about what trust should be and it is usually beyond where the people on the ground actually are. Trust is a process. It comes in stages. We took this into account with The Judgment Factory, but not based on as clear of a stage conception, as you have done here. But I find what you said about trust being relational and emotional (and not just cognitive and moral) to be true. And I think it can be quite scary. So that you have designed interventions for different levels of trust is fantastic. Truly. Well done. I have been thinking about what you said about competing for the Hack on trust. It's funny, for at least a decade I disliked competitions. And then about 5 years ago I started to like them a lot again. I do believe that competitions have great value. But when you commented on the irony of a competition about trust (not your words, but how I interpreted them), I realized that you had a great point. Like a really good one. I have also been thinking about how to realize the larger potential of the MIX. How can we truly MIX? I know a barrier for me is just how busy I am. Most weeks I am lucky if I get sleep, let alone look at what other people are doing. And it takes a good deal of time to actually understand where someone else is coming from and that can be VERY difficult to do online. So many questions that have come on my Hacks have been confusing. I often wished that I could call the person up and find out what they really meant, get to some real understanding. But then, when would I have the time? As it is, I am writing to you on the weekend and I haven't had a legitimate day off in far, far too long. But, strangely enough, it's clear to me that I trust you. Not an easy task to accomplish in two comments. And I appreciate the way that you reached out to me. I was so busy I would not have noticed the power of what you were doing and that would have been my loss. And if you want to go in together on a Hack, let's forget about the competition. Screw it. The real competition is with workplaces that don't work for people. Teams that don't gel. People that feel afraid and defensive at work, not some prize. Now, if you are up for it, we are going to have to figure out how these things do or do not work together. Are we (presuming that you are in, and I am totally cool if you are not in) building a toolbox of methods to use at different times for different issues? Are we building a treatment plan? Both? I think I would be more up for a toolbox of methods as a treatment plan can only come in my mind when there is a clear case in front of me because issues and people are different in different organizations. And just to adjust your expectations, time is a HUGE issue for me. Like a really big one. I have limited time and "trust" is not our main thing at Source Integral, even though I think it is a big piece of the puzzle. Even though we have introduced and injected some very cool practices (if I do say so myself) into various organizations, those practices were a part of a bigger performance picture. So, tell me what you think. And thanks for reaching out, Dan. Of course, I'm in, Annie. You see the same issue I do and the real goal. I have been thinking about an alternative hack, too, one that brings us more together on the topic of trust (and others) through MIX, rather than evoking the shadow sides of a competition. ( I wrote more about this on my blog, if you are interested.) Because of the time limits, I'm not sure that we can figure out how everything fits together, but perhaps we could create a proposal, a "meta hack" if you will, that describes what might happen as an alternative to a contest alone. The idea of a toolbox is one example -- something we could all use and be a part of. I'm wondering if what you and I could do would be to offer an inclusive invitation (via a new hack description), one where we simply point out the irony we have experienced; then ask for ideas and invite people to share their perspectives for how synergies, linkages, and complementary themes could be be developed; how people could make connections with each other in order to really understand the ideas, and then expand on them together. As I think about it, and off the top of my head, wouldn't it be cool to look for opportunities to partner, and offer partnerships among the hack developers to see what emerges, what exciting experiments could be created, so that we become a pool of 'open source' innovators, sharing and building on our ideas rather than simply defending them as individuals. At bottom, I think my fundamental question is whether or not MIX becomes a community through a contest or through a more inclusive vision. That, in itself, might express something of what we are all learning how to do. I like the notion that we all could become a more mutually supportive exchange and in this way a more meaningful force for change. I'll sketch some ideas tomorrow and email you further thoughts. Thank you, Annie, I think you "see me," and if you and I can build upon that initial bond of trust we sense with one another, perhaps we can -- in some small or large way -- foster a broader collaborative approach to innovation at MIX, given the fabulous information already available here and the more that will come. And thank you, too, lest I forget(! ), for reading through my hack and finding its strengths! Many best wishes -- I'll be in touch. Cool. I was thinking along the same lines. I really like the idea of creating experiments. I think the alternative to a contest alone is a perfect idea. And I am willing to risk doing it as an invitation. As I am, quite frankly, sick of defending. After commenting to you yesterday and getting clear about MIXING for real, I was wondering, what is the vision for the exchange post contest? How can we make this a truly collaborative solution space? I will send a feedback form to the MIX asking if and how more than one person can submit a Hack, as that could potentially set in motion some back-end developments in the site that could facilitate how we interact (not necessary, but possible new ways to collaborate strikes me as fun). And as far as finding the strengths in your Hack, they were not difficult to spot. I also really liked how you talked about how not to use your survey. Priceless. I read your blog. I think it is brilliant. I have noticed over the months that I've felt progressively less excited about visiting the MIX because in almost every instance I feel on the defensive. I am (usually the only) woman in Boardrooms around the world. Trust me, I don't need to feel defensive in my spare time. I think that what you said, I don't remember the exact words, but that the assumption that the best ideas will come from aggressive debate... and to change that to winning and losing among people has no place. Yes! How can we push ideas, push our understanding without always pushing each other around? I'm not of the mind to remove all of the push, because I believe it serves a vital function, but if it is only push, no wonder so many people are tired. I'm also so aware of the function of appreciation and the role it plays in trust and in just a good vibe (I'm sure someone will ask me if I have a metric for that). Watch this video: The Compliment Guys. As simple as this is, I think these guys actually have a brilliant business model and Erika (Co-Founder of Source Integral) and I have been trying to figure out where and how to employ these guys for like 5 months. I'm wondering if we could track them down to join us. I want to work with these guys. I really want to work with these guys. These are just the kind of killer app we need. In my mind, I've already placed them in the lobby of 5 different organizations. Just as they are. One small thing, and I hope I've earned the right to say this... In order to build trust, I would extend some appreciation to Gary Hamel. He's done a great deal. Find his strengths. I know you already see them. I will also, as soon as I get the time post a Hack (Source Integral + you + whoever wants to join) on how this community might function post competition. Inspired by Tongal. As an innovator, I am most inspired by real life problems. Real life challenges. Couldn't we get some real-life problems on this site and come together to solve them, rather than writing about ideas in the abstract? Get my drift? Great, Annie. I think that's another fabulous idea! I won't make a longer comment here as I need to spend my time devoted to developing the hack idea I mentioned earlier. I'll send it to you via the message system within MIX, and also as a Word.doc to your website's general (info@) email address. That way you'll be able to add and edit as you see fit. It may just be material that gets incorporated into what you'd like to see post contest and that would be fine for me. A couple other things: one, thanks for the words about Gary Hamel. As far as I'm concerned, he's a superstar. I got to know some of his work through his inspiring book, Competing for the Future, and more recently was really moved by his WSJ blog piece not long ago titled, "Management's Dirty Little Secret." Sensitive, courageous writing. And I am very appreciative of even having the opportunity to participate in an experiment such as MIX. It's true I have had an edge in my voice, and I don't like that, and, Gary, if you are reading this, I apologize for that edge. It's more my own issues and questioning the value of my contributions and my own leadership than anything that has to do with you. And, so, second, I would pick up this same issue of appreciation, Annie, also in the way you are communicating with me. It is a gift in two ways: you have a gift and you gave me one. The video you recommended is a delight and certainly could be incorporated in our joint hack(s). I'll address this in a larger way in what I send you, but let's just say, the idea of the shift from conflict to synergy begins in the moment when appreciation begins to balance criticism. Finally, I just want to add that you mentioned defensiveness creeping into your participation with MIX. I was on the other side of the scale. I noticed nothing, no response to my hack, and that really challenged me for a variety of reasons, many having to do with how I feel about being 60, my contributions, and a recession that has felt isolating to me, and given me much more free time than I've wanted to have. As always, many best wishes, and you'll be receiving something from me soon. I like the way Annie and you have rapidly established a rapport and are talking of joint products. That speaks volumes for professional trust building. Though, it would have been a greater lesson to us had you engaged in a debate! You have noted that trust, post survey, is primarily a function of conversations. Further 'everyone needs to work on at least one ground rule for improved communications based on their self-observations and feedback from others.' Communications is a Barrier in today's corporate world. A hack on achieving the ends of Knowledge, I expect that will include trust, I recently read quotes a study of McKinsey to establish that interactions are growing at an alarming rate and are in fact revolutionizing the workplace. Can this imply that the causes of mistrust are also changing and that they have the growth of interactions as their root. This would mean that the priority is a means for taming the interactions for without that even surveys may have no meaning as their results may be impractical to implement. I am grateful to your hack for being able to surface this insight on mistrust. On reading about the Judgment Factory I knew there were systemic forces at play that needed to be recognized but could not quite identify them and confused the author. Thank you so much for following the conversation and taking a look at my hack! You are asking a great question about whether the causes of mistrust are changing. I wonder, too. In the organizations I have touched, I would say over time there is more openness to the entire issue of trust/mistrust. When I first co-wrote Driving Fear Out of the Workplace, it was 1990, and in those days just making a speech about the book could set an organization's leadership on edge. Sometimes I was stopped at the last minute or derailed in a meeting by an angry CEO who felt critiqued by there might be "undiscussables" in the organization about senior leadership. The fear of repercussions and cynical underlying beliefs that nothing could change were palpable and totally in control. Today, I think the exchange is more open about it, and that's a good thing from my perspective. If we can talk about it, we can begin to examine it. If we can examine it, we can begin to reduce its effects. So fundamentally, I'm very hopeful. And surely, surveys are no final answer at all. It's the conversation -- and the potential connections and understanding that is built, not the tool that matters. As they say, "when you have caught the fish you can throw the net away." If in that exchange, people can begin to appreciate one another's positions, reasoning, and experiences, the system of undiscussability can begin to break down, and along with it the barriers to true innovation. Another way to say this is that mistrust breeds defensiveness and defensiveness in relationships, to me, at least, defines the boundary of innovation in a person, a team, an organization or a society. Our mistrusts and our defensiveness limit what we can learn and what we can be. There are things, for sure, that need to happen so that the conversation is meaningful and constructive, including the willingness to ask for feedback and examine personal behavior, to gain self-knowlege as part of the effort to contribute to greater knowledge in an enterprise, the willingness to be vulnerable to a degree and also to appreciate others. In my experience, these things come slowly, but they do come as the underlying desire of people to create a good workplace and a good life. Again, many thanks for sharing in the conversation and please feel free to reply so that our dialogue can develop even further! Thanks for the reply. I enjoyed its honesty. You have freely acknowledged it is the conversations that matter and if it breaks down undiscussability, like free-flow will, well then so much the better. Raj Kumar has in his hack on Compelling Energy claimed a breakthrough that harnesses IT to manage interactions and induce a culture for free-flow! Do you think such a culture, by extension, can deliver a culture for trust? I found the thought of an infrastructure driven by non-human energy that fosters trust quite fascinating. I will have to take a look! My short answer to your question is that I believe systems of all kinds, work systems, decision-systems, relationships systems, formal and informal norms, concrete and less tangible all contribute or detract from trust. No one system can probably do it all or take it all away. I'm excited to take a look at Raj Kumar's hack and will write more when I get a chance to digest it. Thanks for referring it to me! Thank you for expressing an interest in my hack. Dhiraj is excitable. This is one of those instances I am enjoying his excitement. Basically my work re-writes a very basic conventional wisdom: that people own their knowledge and can choose not to share it. I have progressed on the principle that Knowledge workers must interact to perform their work. They can ill afford to have poor judgments. That would affect their survival. By leveraging norms of teamwork derived from evolution I have constructed a single process for conduct of all Knowledge work. This enables me offer an irresistible way to interact using IT. The value-add of my work is a by-product. Re-writing a basic wisdom, I have discovered, is a tough proposition. It has taken me years to find the philosophy that guides all Knowledge work and establish my work is a method to implement that philosophy. I have explained this in my hack: http://www.managementexchange.com/hack/assuring-results-empowerment-and-... . I regret you may find this hack a bit cynical for I have not had a debate since long. I have treated trust and teamwork as an essential component of feedback and offer intelligent energy for management of interactions so that relationships can develop and constructive thinking takes place. Your survey wll guide me in shepherding my clients to evolve positive relationships. The great leap my work offers is that everything is organized for personnel who wish to contribute. There is no groundwork they need engage in for teamwork or feedback. They can hit the ground running with their ideas. I am going to copy this comment to my Compelling Enrgy site and would request you to do likewise with your response. I have the interests of the readers of my site in mind. If anyone would like to follow my response to Raj, you may find it on the hack listed above (not the one on Compelling Energy, my mistake). Thanks for following and please add your own thoughts! It was kind of you to visit my hack on Achieving the ends of Knowledge and seek to bridge the gap between our approaches. My handicap is I cannot speak in concrete terms as I do not have results on the enterprise scale. I am preparing my Story to give an idea of the results achieved by my prototype on the Department scale. In my reply to your comment at my site I have sought to bridge the gap with your point of view. I hope you will find the time to read it. I will definitely find the time to read it, Raj, and thank you so much for replying. I am looking forward to building the bridge from my side, too. You used the word 'competition' in your reply comment to my comment at your MIX post. Competitions are rarely won by the eager beavers. They demand a joy of playing and leaving the rest to the Gods. My work perhaps is too logical and clinical, possessing as it does overtones of Taylor's Assembly Line. Your work captures the imagination of personnel and has driven remarkable results in application. However, you have felt that in terrms of energy your work could be fragile. Well, combine the two and I believe we have a genuine management innovation for the world, a very humane path for trust, empowerment, and freedom that harnesses technology as never before to progress towards success. "Your survey for me is the perfect guide. It reminded me of the time my son began applying for Liberal Arts education in the US. He is a well educated MBA now and working with a Private Equity firm. He was a carefree bloke in his school days till he filled the Application Form for Liberal Arts. Whole new dimensions of achievement opened up to him. He could see how certain developments mattered and feel their importance first hand. No amount of counselling could have brought about the shift in his mind that the Application Form did. I believe your survey will achieve that. The intelligent energy of my work needs a direction and your survey will contribute to it. I may not implement it but as I said, it will serve to guide the thinking on establishing constructive interactions. You have used the word 'tame' very well. Awed that you interacted with Demming and he had a message for you. I think it is the sense of mission that creates people like him and they learn as they go along. He gave you perhaps his most precious word! It is a message for anybody who hears it - like me." I believe there is something here, Raj, in the combination of our work. As to the ratings, sure, I'd like to win any contest I'm part of, but what the heck, there's another kind of "winning" in meeting great people like you and trying to figure out where our ideas intersect. Another thought I've had about that intersection is how at a certain point in a team's conscious evolution toward high trust, the kind of system you are talking about really would be attractive to members. I'm not suggesting only low or high trust teams would benefit. I'm asking more, how would your system be introduced to a team that is in the midst of mistrust-based conflict? And how might it be introduced in a team that simply wants to actualize it's potentials? Might be two different routes? Or the same, and how would that look? And thanks for bringing the quotation from our other thread over here. That's very kind of you and supports our audience, whoever they might be! There is a word in our Indian invocations to the Gods that perfectly describes what I feel at you and Raj seeing and appreciating each other's work: Savita. One dimension of its meaning is both mother and father. It is not that you folks were missing something. It is just that I felt you both will gain from each other. One of you feels while the other analyses and synthesizes. See what I mean? I wish I could see both of you on top. You absolutely get it! If we can appreciate each other and what we each bring to the MIX, then we can build our house together, rather than fighting over which wall to build first, or building wall after wall and tearing them down because they are not the right one. I so appreciate your comment, and I will look deeper into this word, Savita. Does it also have the flavor of bringing masculine and feminine energies together? If so, indeed, let's see if we can find a confluence of these energies. I will tell you a little secret about my work, Dhiraj, which is probably not so secret. It's this, that although we are wrestling with ideas, our differences can create both a brain and a heart, and so this work also reflects an underlying spiritual component, mostly hidden and undiscussed, as well. And it may never surface directly, and that's perfectly okay. As you say, there is an "invocation to the Gods" that is implicit. To use another metaphor, beyond the house-building one, I would say we are like fleas riding on the back of an elephant. The fleas are arguing about which way the elephant should go, but we have not been talking to the elephant. Do you see what I mean? If this causes you to smile, it will make my day. Again, thank you for your kind thoughts and well wishes to Raj and me. I now send them back to you, as well. The flea bit was funny but it was so real that I decided to write. Indeed, how does a flea talk to an elephant? In the ear? One swish of the ear and the flea is either swatted for life or lazily forgotten. By reference? At best the flea can manage a peanut sized reference which the beast will munch up in no time. By buzzing around? Nothing to be gained by irritation. By getting a giraffe, who has smaller ears, to intercede? Giraffes are ignorant by choice. It fetches them good terms for their services. I am suspicious of ignorance. I have decided to look the elephant in the eye. Someday one of them will blink. Maybe the rest will fall like dominos! I like the way Dhiraj left you with a word. Was he inspired by your Demming story? I think it is drawn from the Gayatri Mantra, a classic invocation of 4 lines. You can read a good interpretation at http://www.adwaitjoshi.com/gayatrimantra.php . The word Savita has been specifically defined by Wikipedia at: http://en.wikipedia.org/wiki/Savita . I think it has less to do with energies and more to do with giving and creation. Hey Raj, that's a good one. If a mouse can roar the flea can scare, or perhaps I should say stare! Savita emerged from my readings of interpretation of the Gayathri Mantra. It is more a sense and a combination of energies as Dan has understood than a meaning. In a way it implies the Mantra itself: a meeting point of the creator and created and a source of tremendous power. I was taken up by a sentence Raj has wrritten somewhere likening his work to switching on a collective's mind power with electricity. And now Dan has written about the under-current of spirituality. Perhaps I sensed it earlier. Thanks for modeling so well all that you suggest for teams here, Dan! Thanks also for this Hack that unpacks issues of trust in teams, that surfaces so many firms we too encounter. Love the way you meld both intellectual and emotional responses, which also is our approach. Like you, we sometimes look at these a bit differently also – since we now know that the amygdala (which holds emotions) is a central part of the human brain. As I read your Hack, I found myself wondering how you grew so deeply involved in the team trust arena, and sense that story would also be an interesting one. The issues you laid out so well here Dan, would appear to require skill. For instance the person who is easily angered, threatened, or jealous of a colleague will enter a team with barriers that may prevent any dialogue on team trust if attacks emerge, for instance. What do you think? Another person, may be highly intrapersonally intelligence (with deep self-awareness) as well as highly interpersonal (with keen skills to engage and learn from others). That person would come to any digital group with stronger skills to engage issues and find common ground among all players. The MIX is a terrific place to test these skills and to make them work for the greater good and for the benefit of the wider purpose of innovation, as Annie and others shared. I plan to take an even more serious look at your excellent survey, to try and see how it integrates with Brain Based certification and coaching also. It would be great with any group to start discussions, about shared practices that move innovations along on a common pathway. 1). Intrapersonal intelligence, where a person grows to know self, in ways that hold integrity, values wisdom, dons faith, reflects regularly, cultivates confidence, nurtures curiosity, and chooses to spend time alone at times. 2. Interpersonal intelligence, where a person learns from others, values people, places others ahead of self, cares for those who get left behind, gives, treats people as finest capital, enjoys pooling different talents, invites feedback to grow, leads by example in teams. 3). Linguistic intelligence, where a person expresses ideas well, articulates accurately, plays with words, shows word pictures, uses good tone to build goodwill across differences, writes out or considers ideas carefully before communicating these to others, typically speaks and feels heard. Thanks so much for dropping by. I can certainly use your guidance, so let me respond to a few of your points. 1. “I found myself wondering how you grew so deeply involved in the team trust arena…” Okay, here's the background. In 1991, I was asked to help a local City Council that had become quite contentious. One of the members asked, “Well, how much trust should we have for one another anyway?” It got me thinking and I developed an impromptu five level scale based on my experience with groups. Then I had members rate the group. Because there were reporters in the audience (due to an open meetings law), the local newspaper ran this headline the next day: “Council rates itself -1.” That certainly got the op-ed page going! And it started me thinking about the scale. Over the next few years I sometimes shared the scale in a slightly more refined version to clients. This was often related to culture change work derived from the book, Driving Fear Out of the Workplace, that I co-wrote with Kathleen Ryan. The scale seemed to respond to a need of managers to know where they and their workplace stood. If fear in the workplace was such a problem, how much do we have here? The scale gave people a place of comparison, either confirming they were “okay” or confirming their suspicion they were not so okay. I also liked the scale because it enabled a fundamental reflective turn related to trust-building: helping people move from thinking about fear and mistrust as something to be cured “out there” or for others (which can be the blame game rewritten), and instead feeling and experiencing it by bringing it “in here,” with us, right now in this room. Some years ago, I started revisiting the five-level format again more deliberately as part of leadership development work, and decided to used my background in HR to build some semantic scales around these trust levels. When the semantic scales got to a certain point of refinement I began to offer the survey as a free download from my website and blog. I figured it might help me get work. Then Ultimate Software (see the Credits section above) kindly offered to send it out with their own promotional materials. When it had been downloaded a couple thousand times, I decided it probably needed its own website as a support base. I really like the notion of taking the survey out from behind the kinds of firewalls that restrict, monetize and create specialist mystique for other tools. I believe this move reflects the culture of the net and the emerging world. The survey isn’t really “open source,” but I think over time it could move in that direction. There is a monetization process called “Registered Use,” but that’s only for consultants who would sell their services in connection with the tool, not for teams that discover and decide to use it on their own. The survey, itself, will never be sold. 2. “I plan to take an even more serious look … to see how it integrates with Brain Based certification and coaching…” That’s fantastic, Ellen. I want to jump right in to help you do that. I would love the feedback and I’d be thrilled to collaborate with you to adapt the survey in ways that reflect your extensive background and understanding of the brain. Please let me know how can I support you as you try it out! 3. “The survey appears to address several of a person’s multiple intelligences…” This motivates me to read more of your materials at MIX and find out about all of them! This is such a great source of dialogue. What I believe, is that perhaps especially for those intelligences that you’ve mentioned, they are released by higher trust levels. Is this possible? And they are integrative in nature. Especially, at the highest trust levels, where teams take on self-leadership most consciously and when they bypass the need to self-protect in order to openly ask: What does this mean for us? What do we want? What could we do together? Then, team members naturally move toward the next level of whatever mission joins them. And in so doing they create the synergies needed for adaptation and innovation. They take the team towards its possibilities and create the future. Thank you again for your comment, Ellen. It’s great to make this connection, and I look forward to more developments! Wow Dan, I see a brainpowered possibility for a collaborative project here. Yes! Your wisdom blends so well with, and informs our 2-bits but we are both after the same brainpowered ends! Dan, I want to name the project today and jump in, yet am paused only by my ludicrous schedule at the moment. Come new year hopefully, that will improve! You are so right – the MIX is such a great source of dialogue. You are also correct in your prediction that those additional intelligences that I’ve mentioned, are released by higher trust levels. That’s so because it take the serotonin that’s generated by good tone to unleash talents and vulnerably exchange ideas that involve risks! My wish would be to naturally move toward the next level of whatever mission joins us, and my reality is that my desk is far too high with renewal projects at the moment, and I suspect your plate is brimming over too. WHAT JOY it would be however, to create the synergies needed for adaptation and innovation. Let’s consider a project (after we can get a bit freer space from current commitments) that would carry these possibilities into creating another innovative pathway into the future. One caveat is that we sustain MITA brain based renewal completely by renewal ventures we market – so I’d also like to consider a possible market that may help us to fund and support a joint innovation project. We find the resources tend to be there and when folks see the value, resources tend to follow fast! What do you think? These are merely ideas that come to mind, and you likely have far better opportunities in mind. The excitement I get in spite of my crazy schedule at the moment, is that the area we address is both the one that put the US in a horrid position in the world economy, and the one that could propel it back into a wonderful place of global modeling and innovative engagement. Yet it’s an area not often identified as both the toxic culprit and the winning opportunity:-). You? YES! I think the timing will be fine and will work itself out as it needs to -- and really the first of the year is only a short ways away. I'm happy to work with you to help define an appropriate project and can't see why your caveat couldn't be factored in. The only caveat for me is not changing the fundamental notion of a free survey online. We can talk more about all of this off-line via email or a call. In the meantime if you'd like to try out the survey just to see how it works, please be my guest. If you'd like me to list you as a Registered User (basically like a license to use the Survey with clients), do let me know and I'll be happy to waive the one time fee. If we don't arrange something sooner, I'll ping you in January. And, oh, that last paragraph of yours. A great deal to mine there! That's one reason why I also think there might well be something very fertile in a collaboration. Personally, I just totally groove on the notion of integrating multiple intelligences via trust. THAT could be a magnificent win for everyone. Thank you so much, Ellen. I'm very grateful you are here.